We all know that the Chinese celebrate the one-month “birthday” of a baby by serving red eggs (and pickled ginger and yellow glutinuous rice with curry and red angkoo kuihs! – but that’s another story, hehe!). We Chinese love the color RED as it embodies happiness, good fortune and EGGS have always been a symbol of Life. 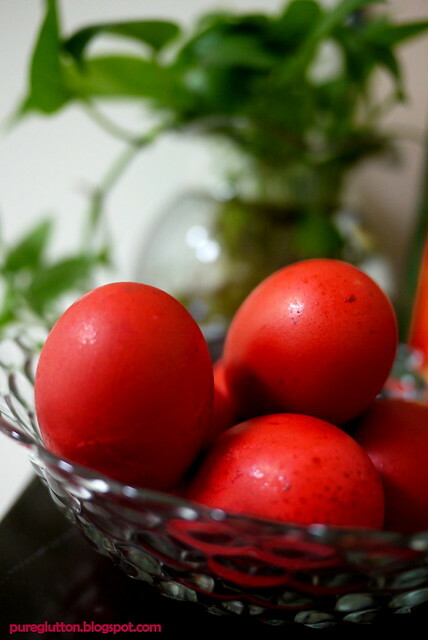 It isn’t surprising at all to note that the traditional red-dyed eggs are not only featured in babies’ one-month celebrations, they are also served during birthdays, well… because birthdays are also a celebration of “renewed life”, no? I remember my mother used to prepare 2 red eggs for my birthdays when I was a kid and it was something I always looked forward to. It was quite a thrill for me to crack open the red eggs and they tasted so good when eaten dipped in some soya sauce. Yes, life was much simpler back then. Eggs play a pivotal role in Easter celebrations: whether from folklore or a religious point of view, the egg is widely used as a symbol of life renewed. 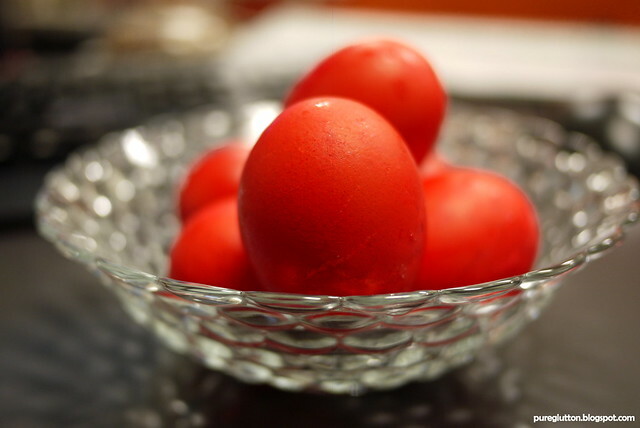 Did you know that the Greeks also dye their eggs red for Easter? It is their brightest symbol of Greek Easter, representing the blood of Jesus Christ and rebirth. It’s interesting to know that the Greeks make their own traditional natural red dye by boiling onion skins and vinegar! (I must try that out one day). Anyway, what got me interested in this red eggs story is that recently I was asked to make them. You see, I have seen and eaten so many red eggs in my life but I have never ever attempted to make any! My colleagues wanted to give something “traditional” to a few birthday people and naturally, red eggs was suggested and somehow, the task fell on me. 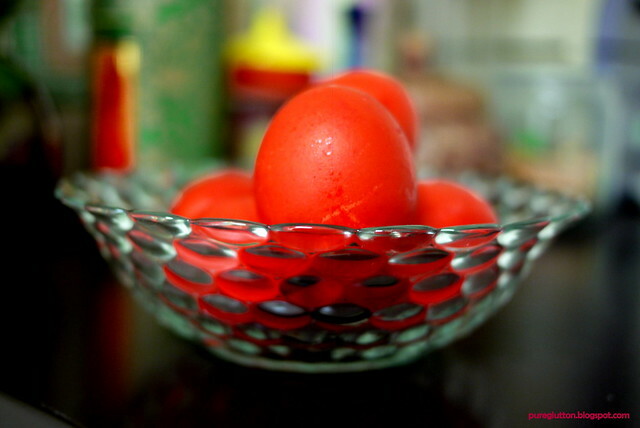 It may sound simple – I mean, how difficult is it to dye some hard-boiled eggs red, right? I wanted to make sure they turn out a deep red, not pink or various shades of pink & red. Yes, I’m sure you have seen poorly-dyed eggs which have uneven red/pink/white patches all over. I sought help from Twitter and Google and went looking for good red dye in the shops. I learned that adding vinegar to the dye solution helps in giving better coverage and even-ness of colour. Oh yeah, I followed every instruction to the “T”. The tricky part was actually in how or where to place the eggs for drying after dyeing, heh! The guidelines were to place them on a wire tray, which I did… but then I found out that resulted in some “blotches” at the points where the eggs touched the tray. Ahhh…so how so how?? Well, I did my best to rub & massage those spots to even out the blotches but still, there were some blemishes left. There must be some way to hang or suspend the dyed eggs so that they don’t come into contact with anything while drying out??! Any sifu out there who can enlighten me on this? Looking at the eggs, I think I should have smoothened out the shells first with some sandpaper before dyeing them… to reduce those natural dots and ridges which are still visible.